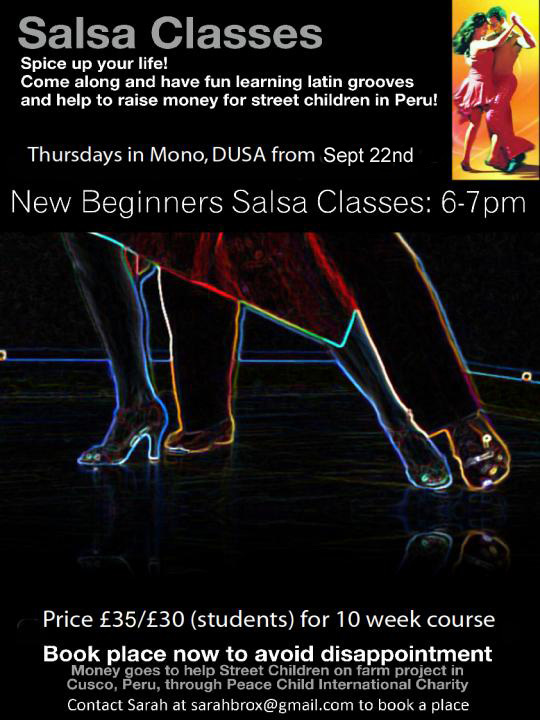 NEW Beginners Salsa classes ( cross body style), starts Thursday Sept 22nd at MONO, Dundee University Union building, (downstairs), 6-7pm. 10 week block £30 ( stu), £35 ( otherwise). Join class in first 2 weeks of block only. Please come 10 min early for the first class to register & pay for the block. Email sarahbrox@gmail.com for more details/ reserve a place. All money goes to the Azul Wasi street childrens project, near Cusco, Peru see www.salsadundee.com for details.